Handmade plush dolls. Bags (ita-bag). Anime, manga, and video game merchandise. As An Online and Convention Merchant; What Can I Do To Reduce Plastic Waste? "When you receive a package from us, you may encounter some re-purposed packaging materials. We are conscious of keeping our footprint small and limiting the amount of waste we generate. So, rather than buying new packaging materials, we re-purpose what we have hanging around. See if you can keep their life going (and pay it forward) by finding clever ways to re-purpose them!" Yes, that's right. We've been using recycled packaging whenever we ship out orders. I think we started doing this 2-3 years ago. We keep plastic bags, paper, bubble wrap, and strings. We haven't received any complaint from our customers yet. That's a good sign and we plan to continue doing this. Local couriers still wouldn't accept packages without their mailing bags though. At events/conventions, we have shifted from plastic bags and opted for paper bags. It would be great if con goers would all bring their own bags too. Being an online and convention merchant, it is impossible to completely avoid plastic. Almost everything comes packaged in plastic. The small steps that we take may seem irrelevant or useless but we believe that it is better than doing nothing. Imagine what 7 billion humans could accomplish if we all took action. We plan to display this at our convention tables. You can find great tips and resources online if you wish to help the cause. There are even Facebook groups dedicated to help members lead a zero-waste lifestyle. Attention Ita-baggers! You need to keep your bags clean and well maintained so we are sharing this tip. 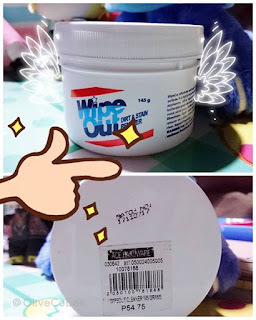 (｀・ω・´)” Wipeout Dirt and Stain Remover can be easily obtained locally. It's cheap, easy to use, and you'll most likely find useful on cleaning other stuff. You can use it on leather, vinyl, shoes, appliances, laptop surfaces, glass, etc. So many uses! This is what I use on my personal bags so they will stay nice and shiny. (☆^ー^☆) Thanks so much for supporting our shop. We offer locally made and imported bags and we want to make sure that your hard earned money will not go to waste. Keep collecting and sharing your photos with us! (◍•ᴗ•◍) ❤ KEEP IT SHINY! We no longer do commissions and/or custom plush orders.